At their August 11th meeting (2pm, Shay Stadium, Halifax), Calderdale Clinical Commissioning Group Governing Body will face truly chilling facts about the effects of so-called Sustainability and Transformation Plans, which will start to be carried out in October/November this year. The clinical model for the proposed Right Care Right Place Right Time scheme, that NHS commissioners and the Calderdale and Huddersfield hospitals have finally agreed after arguing about for two years, could be thrown up in the air yet again by a cost-cutting 5 year hospitals financial plan that is being drawn up by Ernst and Young (EY), at a cost of £1m to the deficit-ridden hospitals Trust. The Calderdale and Kirklees Joint Health Scrutiny Committee (JHSC) met on Wednesday 21 October, to find out what’s happening with the proposed hospital cuts and changes that are known as Right Care Right Time Right Place. 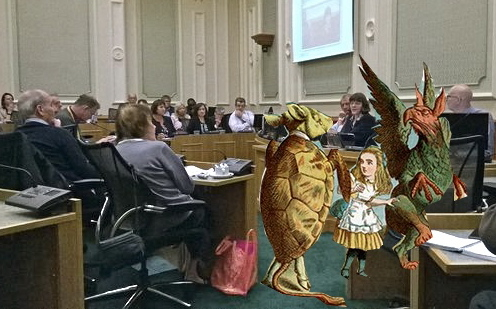 The meeting was like falling down Alice in Wonderland’s rabbit hole and arriving in time for the Lobster quadrille. Will you, won’t you, will you, won’t you, will you consult the public? The recurring theme at the JHSC was: Will you, won’t you, will you, won’t you, will you join the Public Consultation dance? As expected, both Calderdale and Greater Huddersfield NHS commissioners today agreed to postpone the public consultation on proposed hospital cuts and changes. The consultation had been scheduled to start this month. One burning issue for the public is what NHS bosses want to do to our A&Es. A slide presented at the meeting showed we could end up without a full A&E at either hospital. The slide said that one emergency centre or specialist emergency centre is planned – but draft specifications from NHS England say that only specialist emergency centres provide full A&E care. The delay to the public consultation is because the Clinical Commissioning Groups don’t know if the hospitals Trust will be financially viable in five years time and are waiting for it to produce a Five Year Financial Plan. The contract for Calderdale Royal Hospital services, which should have started on 1 April 2015, is still not signed and on 24th July both parties entered arbitration with the Centre for Effective Dispute Resolution (CEDAR) as mediator. The outcome is not yet public knowledge – but contract negotiations were still continuing on 4th August. Problems with the contract from the Calderdale Clinical Commissioning Group’s (CCG’s) point of view were discussed at the June 11th Calderdale CCG Governing Body Meeting, while the hospital Trust’s 28th July Board meeting papers show some of their side of the conflict. The Trust are holding out for a Payments by Results contract, which Dr Matt Walsh told the CCG Governing Body “is not the CCG’s preference”. Until now, the contract between the CCG and Calderdale and Huddersfield NHS Foundation Trust (CHFT) has been a block activity contract, where the CCG pays for a set amount of clinical activity. Calderdale and Huddersfield NHS Foundation Trust (the hospitals Trust) has told staff that it is lodging a formal complaint with Monitor (the NHS competition enforcer) about the Clinical Commissioning Groups’ (CCGs) award of the £238m Kirklees community health services contract to Locala. The hospitals Trust had also bid for the contract, in partnership with the three Federations representing GPs across Kirklees (PHH, Rowan and CURO), Mid-Yorkshire Hospitals Trust and Forget Me Not Children’s Hospice. Anyone who wants to find out about the sell off of our NHS, and understand how this is going to affect patient care, has their work cut out as the plot thickens around the £238m Huddersfield and North Kirklees contract for Care Closer To Home. This contract is to take services out of the hospital and integrate them into community health and social care services for chronically ill and frail elderly people, with the aim of cutting acute and A&E hospital admissions and services. This is in order to cut NHS spending. Otherwise a £22bn NHS funding gap is predicted to open up by 2020. The award of the contract has been at a standstill for a month. Yesterday the Health Service Journal reported that the massive contract has gone to a consortium led by Locala, the community health company that was set up in 2010 with staff and assets transferred from NHS Kirklees Primary Care Trust. The organisations involved – the Clinical Commissioning Groups and Locala – maintain that the contract is still at a “standstill”.